I am not a saint, although from some folks’ reaction to my personal story, it seems that they see me as such. While it’s true that I do try to be a “clear channel for blessing” as befits my adopted Quaker tradition, that’s not the same thing as being a martyr in the Catholic tradition into which I was born. Every decision that my husband and I have made in the course of our Vietnam adventure, unconventional though it may have been, can be argued for in pragmatic, or even economic, terms. Selling our home in 2006, for example, and putting the proceeds of the sale into foreign-denominated CDs turns out to have been a pretty shrewd move, in retrospect. Certainly, selling our gas-guzzling vehicles and our oil-heated house does not look too foolish now that oil has reached $100 per barrel! The monthly rental for our four-story Da Nang townhouse is less than the amount we previously spent for taxes and insurance on our American home. While electricity rates are about the same here as in the States, it doesn’t take much to power our small fridge, lights and electric fans. Likewise, although gasoline prices parallel those in the States, it doesn’t take much fuel to propel our motorbike. Gone is the perceived need to purchase a myriad of insurance products to protect our assets and our stream of income. Car insurance, life insurance, long- and short-term disability insurance, liability insurance, homeowners and flood insurance—all gone. We opted to relinquish our health insurance also—you can read my thoughts on that issue here. My husband Dave and I had wrestled for years with the ethical issue of paying taxes to support a government engaged in an illegal war. That dilemma is resolved for us now, as we don’t have an income that reaches a taxable level. And our teen-aged son is beyond the reach of military recruiters and a possible future draft. Our jobs are history, along with the stress that accompanied them. 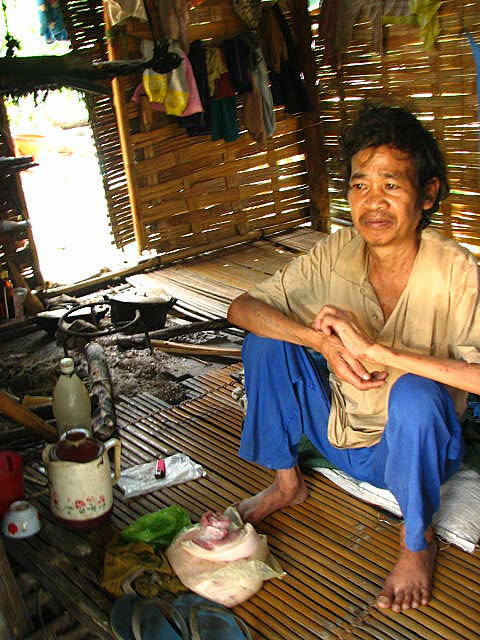 The cost of living is low enough here in Vietnam that we can and do live off the proceeds of the sale of our home. (We had neither a savings account nor pensions.) Other expatriates that we know live comfortably here on modest pensions. Still others get by on what they earn by teaching English for a few hours a week. Without that constant immersion in the American consumer culture, we find that there isn’t much that we really need to purchase. We got rid of most of our belongings when we moved to Vietnam and we still have an embarrassment of riches. My volunteer work here consists of doing the kind of real-deal physical therapy that I dreamed of doing when I first entered physical therapy school back in the 1970s. I’m making a real difference in people’s lives here—without breaking my back and without spending any time at all doing meaningless paperwork! Does that sound like martyrdom to you? Stepping out of the American rat-race and living a meaning-filled life in a third-world country is NOT impossibly quixotic. I’m here to tell you that it can be a personally gratifying and pretty darned comfortable way to go. Mirror neurons, asserts neuroscientist V.S. Ramachandran, will be to psychology what DNA is to biology. These so-called “Dalai Lama” neurons, first identified in a lab in Parma, Italy, in 1995, are thought to be key to the human ability to learn skills and language from one another. These are the neurons that enable us to “read” each other’s facial expressions and body language. They’re what cause us to cringe when we watch our child receive an injection or to flush with embarrassment when we witness someone else “play the fool”. When our mirror neurons are in play, we “pick up” on subtle signs of distress from those around us and we are moved to alleviate the cause of that distress. They allow us to experience compassion. Mirror neurons teach us how to behave in community. While the discovery of mirror neurons is recent, savvy forces have been making use of them for a long time. Totalitarian regimes have always known the importance of squelching demonstrations of dissent. Your mom warned you to stay away from “bad influences.” And there are real economic reasons behind the fact that advertisers pay big bucks to popular figures who model their latest fashions. It turns out that the motivation behind our behavior is a lot less rational than we would like to believe. Studies show that we are more likely to act in accordance with the behavior that we see modeled around us than we are to act in accordance with our professed beliefs. If this is true, it’s time to examine what we have available to mirror. If you lead a stereo-typical American life, grabbing a pop-tart on the way out the door, driving your auto solo to work, spending the day in an office cubicle, grabbing some fried chicken at the take-out window before sitting down to face whatever the main-stream media has placed before you on the television screen in the evening, who is providing the template for your life? Some of us feel guilty that we don’t feel more compassion for the “unfortunates” of this world. Others don’t seem bothered and even make derogatory remarks about “rag-heads” and “welfare queens” and “wetbacks”. The plain fact is that it is impossible to feel compassion for an abstraction. What is there to mirror? If you do feel led to lead a more engaged life, more in keeping with your Christian or Buddhist or Muslim or humanist beliefs, you’ve got to be present; you’ve got to turn your full attention to human beings who are now only abstractions to you. For me, a big “ah ha!” moment regarding the “homeless situation” was driving up to a Catholic Worker “Breakfast on the Streets” site in Norfolk, Virginia, at seven AM one grey and blustery morning to see one hundred and twenty-five human beings standing quietly in line, each waiting for a cup of coffee, a bowl of boiled grits and two cold hard boiled eggs. Talking with them later, about the misfortunes and ways of thinking that had brought them to this point, I was overwhelmed with the sense that there, but for fortune, could be a child of my own. For an even easier step, which only involves turning away from your television set and turning towards your computer monitor, I recommend taking a tour of the “Axis of Evil” through the eyes of Andy Chang, a young man who photographed his way across Northern Africa and into the Middle East. Andy’s artistry with a camera allows you to soak in the humanity of the people he met on his journey. Try to hold his images in your mind when next you hear calls to strengthen the American-Israeli position in the Middle East. Think about these faces when you hear terms like “military options” and “collateral damage” discussed. 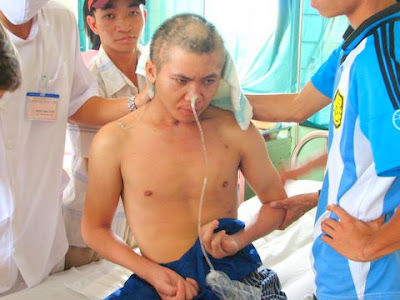 Working in a Vietnamese rehabilitation hospital as I do, without the benefit of being fluent in Vietnamese, certainly comes with its share of difficulties. Yet many times I feel as if I better appreciate a bereft family member’s despair or a brain-injured man’s confusion when I focus on those individuals directly, rather than relying on my translator's account of their situation. Your own personal set of mirror neurons can bring you clearly into another’s experience. What, for example, do I have to tell you about this man, in order for you to empathize with his situation? You are already wired to be a compassionate human being. It’s up to you to “exercise” your compassion. Last year, decades after dumping 20 million gallons of the toxic chemical Agent Orange all across the Vietnamese landscape, the US pledged to contribute $400,000 USD to partially fund a new study on the topic. What a relief! 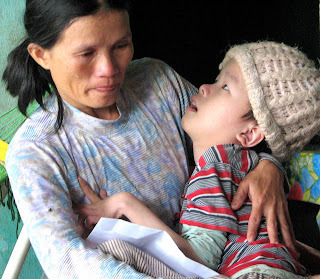 I’m sure that uncertainty regarding the outcome of this study is the only thing preventing the US from offering substantial assistance to people like May and Song, the articulate but impoverished parents of four disabled children, each conceived in the years following their father’s sojourn in an area which earlier had been heavily doused with Agent Orange. 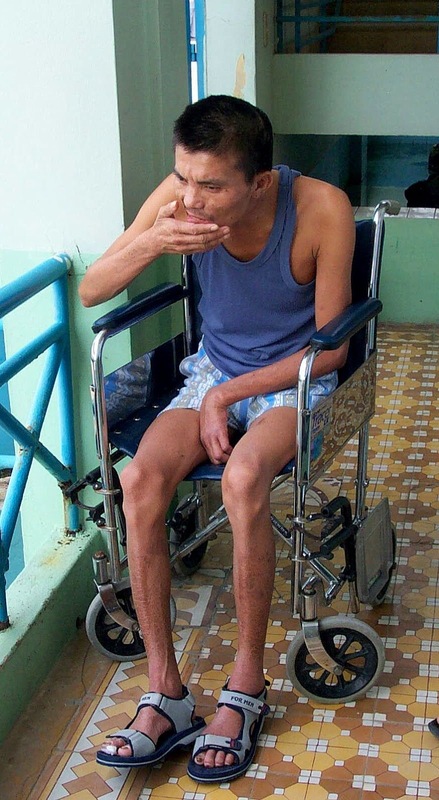 Finally, almost forty years after another young man emerged from a defoliated jungle with a bizarre skin condition to father a son with strange, canoe-shaped feet before he, himself, succumbed to cancer, the US will know what should be done to make amends. Sixteen years after that man’s son produced a daughter of his own, afflicted with the same canoe-shaped feet, the wealthiest and most powerful nation in the world is finally getting down to the business of deciding whether or not it might have an obligation to help families like these. I have to wonder how the results of that million dollar study will ultimately benefit the generations of individuals and families afflicted with birth defects and early cancer deaths, who live in the poverty that still lingers following decades of US-imposed embargo, superimposed upon years and years of war. Will the proposed $14 million project to isolate a patch of dioxin-soaked ground at the Da Nang airport bring them any solace? I’ve been tagging along recently with a group of American college students affiliated with the SUNY Brockport Vietnam Program as they make their Thursday morning home-visits to families of disabled children here in Da Nang. The students are studying to be social workers, so they do what they’ve been trained to do: they sit down with families and ask them questions. Then they listen. Two weeks ago, we sat and listened to the diminutive mother of the canoe-footed girl tell us how sad she was that her daughter, a serious and dedicated student, could not attend high-school. The school, she said, was too far to walk to, and the mother was not able to balance her daughter safely on the back of her bicycle in order to take her there. (Her daughter’s canoe-shaped feet not only prevented her from walking without wooden crutches, but also made it impossible for her to pedal a bicycle herself.) A kind friend who lived next to the school, she said, had offered to let the daughter stay with her so that she could more easily attend school but, alas, that was impossible. “Why is that?” asked a student. 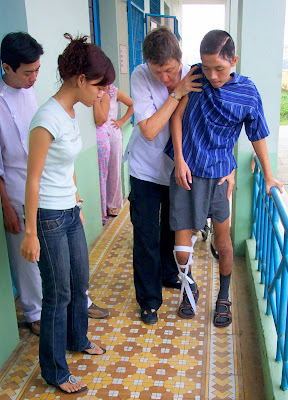 Being the only physical therapist in the room, it fell to me to suggest that, perhaps, the girl might sit down on a plastic chair when she showered and that, if a hole were cut in the seat of the chair, it might allow her to attend to her own hygiene when she used a typical “hole-in-the-floor” Vietnamese toilet. The mother’s jaw dropped and the father beamed. As we departed, they each pumped my hand vigorously, smiling broadly. What had happened? Somebody sat down and listened to their story and made a simple suggestion. And, because of that, a sixteen-year old, third-generation victim of Agent Orange might go to high school. We didn’t need a million dollar study. All it took was a few American college students and one middle-aged American PT, listening to one family’s story. Why is that so damned difficult? We didn’t even have to buy the plastic chair. I realize that the recent submissions I’ve sent you may seem pretty bleak. In fact, I’m not sure you would consider me a “card-carrying progressive” anymore. Well, here’s one more, and I can’t say that it’s any happier. I’m writing about what I’m feeling about America these days, but I’m doing it from my own unique point-of-view here in Da Nang. I’m writing for “my tribe”—despondent progressives (check out the comment section following any of Common Dreams’ recent articles). These people, like the family members I describe in the attached article, Going Home for Tet, have been engaged in heroic efforts against impossible odds—in our case, trying to right the ship of state. It can’t be done. (Sorry, that’s my “unprogressive” conclusion.) I think we’re headed for a new stage in history, the one that will inevitably result from the end of cheap oil and the unraveling of the American economy. Building vibrant, functional, sustainable local communities will be essential. Many of us are in mourning for the loss of our idea of what American could/should be and we need to talk about that. But what are we to do after that? I want to write more and do more about building local food networks and compassionate communities to take the place of the corporate-dominated exchange economy and the professionalization and out-sourcing of every aspect of our lives. In order to build that new society, we will need every bit of energy and creativity that we can muster. We don’t need to piss it away tilting at windmills. As the Lunar New Year countdown reaches its final week, everybody in Vietnam is heading home for the holidays. Northbound buses, trains and flights out of Ho Chi Minh City are completely booked as students, factory workers and businessmen alike stream homeward. Tet in Vietnam is like Thanksgiving, Christmas, New Year’s and Easter in America -- all wrapped up into one joyous celebration. And being home, with family, is the key element in this week-long event. There is no point in trying to embark on any business arrangement or to discuss any matter of importance these days because everything will be dealt with “after Tet”. In America, hospital workers are accustomed to seeing empty beds around the Christmas holidays as doctors and patients alike do not “elect” to do elective surgery then. Likewise, patients and hospital staff often push towards getting the patient “home for the holidays”. That’s true in Vietnam, only more so. The rehabilitation hospital where I volunteer in Da Nang will be virtually closed over the week of Tet. Everyone who can physically get out the door has gone. The only two patients who remain on the “serious” ward are a young woman whose pelvis was crushed in a motor vehicle accident and a brain-injured girl whose family lives on a remote island in the South China Sea. Everybody else went home, including a quadriplegic riding sandwiched between two family members on a motorbike. But the joy of the holidays and imminent family reunions was muted last week on the “serious” ward. This ward houses those with the most recent and severe brain-injuries. Other patients moved on, but those two young men remained in those beds. Yet, as long as they remained in the hospital, in the company of other head-injured patients and their families, the young wife and the middle-aged mother could cling to some nebulous hope of recovery, despite the increasingly obvious fact that things were not looking good. Then came Tet. One morning I arrived at the ward to find the mother weeping silently as she bent over her son – stretching, stretching his ankle as I had taught her to do some months earlier in order to avoid muscle contractures that could prevent him from standing, flat on his feet. Her husband, the boy’s father, who had always been ready to lend a hand to anyone else on the ward, was hurriedly packing up the last of their belongings in preparation for the long trip home. The young wife of the other severely disabled man stood watching, with a tremulous smile on her face. She, too, was going home with her husband that day. Home at last, to be with their three young children and her “good neighbors” – and the husband who would never walk or work or talk to her again. Home at last, after months of “intensive caring” to the new normal—a life without hope. Maybe that’s too harsh. How can we live without hope? Certainly these women, like many Americans nowadays, realize that the futures that they once dreamed of and worked towards have been dashed. The mother will not see her son enter university. He will not have children of his own and he will not be an aid and comfort to her in her old age. The young wife will care for her three young children and, now, one very large, eternal infant with no help from a loving spouse. How she will earn a living, I can’t begin to imagine. But their epic struggle to reverse this catastrophic change in their lives has ended. What has happened cannot be undone. Yet they endure. And when they return home this Tet, they will be enfolded and supported by their families and their communities. That is their only hope.